Condensation of water vapour, thunderstorms, cyclonic and anticyclonic conditions etc. depend on Adiabatic Lapse Rate. Adiabatic Lapse Rate determines the Rate Of Condensation and the rate of condensation determines the amount of Latent Heat of Condensation Released. All the explanation below is meant to explain ‘Adiabatic Lapse Rate’ and ‘Latent Heat of Condensation’. These two terms occur frequently in almost all the future topics of climatology. 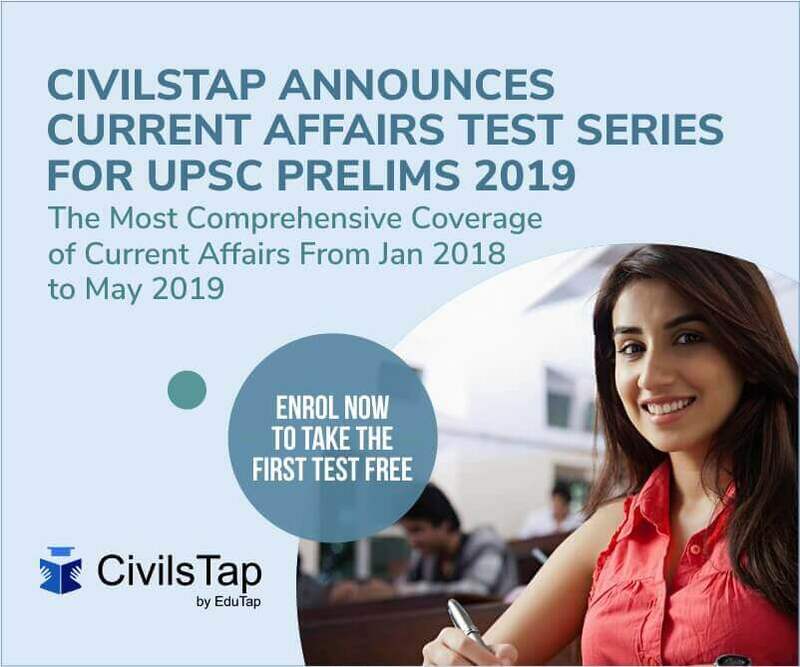 They won’t be specifically asked in the exam. But understanding them once for all will help immensely in understanding the future posts on climatology. Lapse rate is rate of change in temperature observed while moving upward through the Earth’s atmosphere (troposphere to be specific). The lapse rate is considered positive when the temperature decreases with elevation, zero when the temperature is constant with elevation, and negative when the temperature increases with elevation (temperature inversion). The lapse rate of non-rising air – commonly referred to as the normal, or Environmental, Lapse Rate (ELR) – is highly variable, being affected by radiation, convection, and condensation; it averages about 5 °C per kilometer in the lower atmosphere (troposphere). When we move up a hill, we notice a fall in temperature. This fall in temperature with elevation is primarily due to two reasons. With increase in elevation, the concentration of greenhouse gases decrease (Water vapor and carbon dioxide fall sharply with elevation). Hence the heat absorption capacity of atmosphere will also decrease. This sort of fall in temperature with elevation is called Temperature Lapse and the rate at which it happens is called Temperature Lapse Rate or simply Lapse rate. Lapse rate is the rate of fall in temperature of atmosphere with elevation. 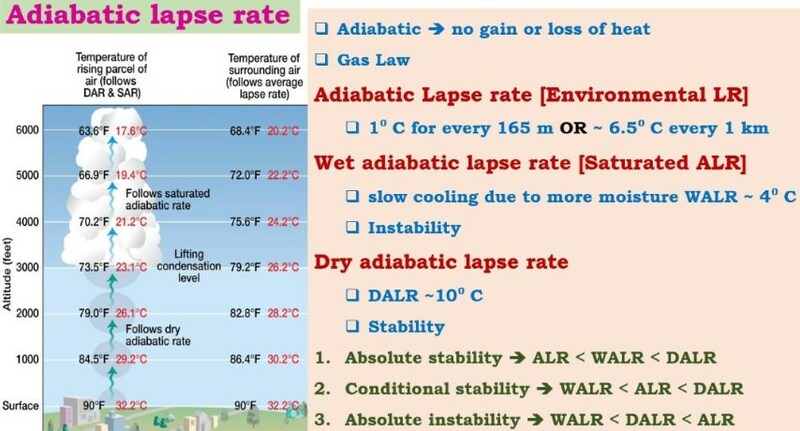 Adiabatic Lapse Rate is the rate of fall in temperature of a rising or a falling air parcel adiabatically. Adiabatic or adiabatically: Heat doesn’t enter or leave the system. All temperature changes are internal. Adiabatic Lapse rate is governed by Gas law. According to gas law Pressure ‘P’ is directly proportional to Temperature ‘T’ when Volume ‘V’ is a constant. When we blow air into a balloon, pressure increases but temperature doesn’t increase due to proportionate increase in volume (here V is not constant). When excess air is blown, balloon bursts as it cannot with stand the pressure. In a vehicle tube, volume remains constant. When air is blown, pressure increases and hence the temperature. We are usually advised not to have full blown tubes because when vehicle travels on a road, the friction between the tire and the road increases the temperature of the air in the tube. As temperature is directly proportional to pressure, increase in temperature leads to increase in pressure and at certain pressure threshold, the tire bursts. The above examples explain the relation between Pressure, Temperature and Volume. They are both non-adiabatic processes as there is (will be) heat exchange between the system and the external environment. An air bubble rises in water whereas stone sinks. This is obvious. The stone is denser (heavier than water) and it sinks whereas the air bubble is less denser (lighter than water) and it rises. Similarly, a parcel of air rises when it is less denser than the surrounding environment and it falls when its density becomes greater than the surrounding environment. When an air parcel is subjected to differential heating compared to the surrounding air, it becomes lighter (less denser) or heavier (more denser) depending on whether the air parcel is heated or cooled. When an air parcel receives more heat than the surrounding air, its temperature increases leading to an increase in volume (Increase in Volume == Fall in Density). The air parcel becomes lighter than the surrounding air and it starts to rise. This process is non-adiabatic (there is heat exchange between the air parcel and the external environment). But when the air parcel starts to rise, the ambient pressure on it starts to fall [The atmospheric pressure decreases with height, so the pressure on the air parcel decreases with height]. With the fall in ambient pressure, the temperature falls and the volume increases. This is adiabatic [there is no heat exchange between the air parcel and the external environment. All the temperature changes are internal. Temperature changes are only due to change in pressure or volume or both]. This fall in temperature with the rising of the air parcel is called Adiabatic Temperature Lapse. And the rate at which it happens is called Adiabatic Lapse Rate [This is Positive Adiabatic Lapse Rate as the Temperature is falling]. An air parcels falls to the lower levels of troposphere when it is cooled sufficiently. When an air parcel is in the upper levels, it gets cooled due to lower temperatures (Lapse Rate). It’s volume falls and it’s density increases. When it becomes more denser than the surroundings, it starts to fall. This also happens when an air parcel is in contact with cooler surfaces like mountain slopes. We will see more about this in temperature inversion. The beginning of fall is a non-adiabatic process as there is an exchange of heat between the air parcel and the surrounding environment. When an air parcel is falling, the atmospheric pressure acting on it will increase and its internal temperature will increase adiabatically. [This is Negative Adiabatic Lapse Rate as the Temperature is rising]. Katabatic Wind is a hot dry wind that blows down a mountain slope. It is an example for a falling parcel of air in which the temperature changes happen adiabatically. Adiabatic change refers to the change in temperature with pressure. On descent through atmosphere, the lower layers are compressed under atmospheric pressure. As a result, the temperature increases. On ascent, the air expands as pressure ‘decreases’. This expansion reduces the temperature and aids condensation of water vapour. Condensation of water vapour releases the Latent Heat of Condensation in the process. This latent heat of condensation is the major driving force behind tropical cyclones, convectional rains. Adiabatic lapse rates are usually differentiated as dry or wet (moist). The Dry Adiabatic Lapse Rate (DALR) is the rate of fall in temperature with altitude for a parcel of dry or unsaturated air (air with less moisture, to keep it simple) rising under adiabatic conditions. Unsaturated air has less than 100% relative humidity (we will study about Humidity in future posts). [Saturated air == The air that cannot hold any more moisture. Its stomach is full. The dry adiabatic lapse rate for the Earth’s atmosphere equals 8° C per kilometre. Dry Adiabatic Lapse rate is mainly associated with stable conditions [because it has less moisture]. When an air parcel that is saturated (stomach full) with water vapour rises, some of the vapour will condense and release latent heat [Additional Heat from inside]. This process causes the parcel to cool more slowly than it would if it were not saturated. The moist adiabatic lapse rate varies considerably because the amount of water vapour in the air is highly variable. The greater the amount of vapour, the smaller the adiabatic lapse rate [because the condensation process keeps on adding more latent heat of condensation]. On an average it is taken as 4° C per kilometre. Wet Adiabatic Lapse rate is mainly associated with unstable conditions [because it has more moisture]. As an air parcel rises and cools, it may eventually lose its moisture through condensation; its lapse rate then increases and approaches the dry adiabatic value. The difference between the normal lapse rate in the atmosphere and the dry and moist adiabatic lapse rates determines the vertical stability of the atmosphere. For this reason, the lapse rate is of prime importance to meteorologists in forecasting certain types of cloud formations, the incidence of thunderstorms, and the intensity of atmospheric turbulence. If ALR at a place is greater than 6 °C/km then it is called DALR = Less moisture than normal = more stable than normal. If ALR at a place is lesser than 6 °C/km then it is called WALR = More moisture than normal = less stable than normal or instability. Absolute instability: ALR (at a place) < WALR == Excess moisture in the air parcel == It will rain violently. The above condition simply means that there is little moisture in air. When there is little moisture, condensation of water vapour is low, so latent of condensation released will be low, and the rising parcel of air gets cold quickly, and it falls to the ground once it becomes denser. So there will be no cloud formation and hence there will be no rain (thunderstorms). This simply means that the condition is stable. The above condition simply means that there is enough moisture in air and there are chances of thunderstorms. The above condition simply means that there is more moisture in air and there will be thunderstorms. When there is unusually high moisture in the air parcel, condensation of water vapour will be very high, so latent of condensation released will be great enough to drive a violent thunderstorm. So the weather will be associated with absolute instability. Latent heat of condensation is the driving force behind all tropical cyclones. It is the heat released or absorbed during phase change. Latent heat, characteristic amount of energy absorbed or released by a substance during a change in its physical state that occurs without changing its temperature. The latent heat associated with melting a solid or freezing a liquid is called the heat of fusion; that associated with vaporizing a liquid or a solid or condensing a vapour is called the heat of vaporization. The latent heat is normally expressed as the amount of heat (in units of joules or calories) per mole or unit mass of the substance undergoing a change of state. For example, when a pot of water is kept boiling, the temperature remains at 100 °C until the last drop evaporates, because all the heat being added to the liquid is absorbed as latent heat of vaporization and carried away by the escaping vapour molecules. Similarly, while ice melts, it remains at 0 °C, and the liquid water that is formed with the latent heat of fusion is also at 0 °C. On X – axis: Heat supplied to the system. On Y – Axis: Temperature change in the system. From the above graph, we can observe that there is no change in temperature in the system during change of state or phase change (solid to liquid, liquid to solid, liquid to gas and gas to liquid). Then where did the heat supplied go? So latent heat of condensation is the heat released when gases turn into liquid.